Holy cucumber! This miracle vegetable is highly functional for creating fast, DIY beauty treatments, perfect for taking care of sensitive skin issues such as inflammation and irritation. Rich in water, vitamin C, amino acids and mineral salts, the cucumber has numerous, valuable properties. With its sulfur content, the cucumber is able to lighten dark spots on the skin and soothe any sunburn. If used consistently, cucumber improves the appearance of wrinkles and oily skin. 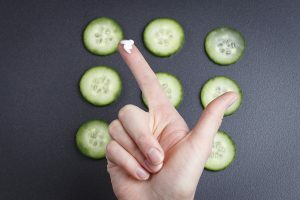 Dark Circles: One of the most effective natural remedies against the most stubborn dark circles is simply the cucumber. Apply cucumber slices on the eye area, not too thin, and keep them in place for about 15 minutes. Remove the cucumber slices to immediately notice smoother and more relaxed skin surrounding your eyes, automatically giving you a refreshed new look! Excessively oily skin: Thanks to its astringent properties, cucumber is also very useful for taking care of oily skin. If you have problems with excess sebum and skin that tends to shine, try the cucumber-based mask below. When rinsed, the skin will be more compact and drier. Irritation and redness: Sensitive and reactive skin very often involves problems regarding harsh chemicals found in cosmetic products or excessive cleansing strategies that irritate delicate skin. To reduce the redness, mix the pulp of a cucumber and a teaspoon of aloe gel, another important natural ingredient. The irritation will disappear within a few minutes. Taking care of your skin means treating yourself to a relaxing, hydrating mask. Because your skin is always subject to stress, caused by both makeup and harsh weather conditions, masks are an excellent way of waking up tired skin. Lemon and cucumber are two exceptional natural healing products, low-priced and easily found in every household. The first helps to lighten the skin spots, tightens the pores and deeply cleanses the skin, while the second improves circulation and reduces swelling in the eye area. Try it and let us know what you think! Blend the cucumber with the skin. When it is reduced to a soft cream, add the squeezed lemon and yogurt in a bowl. Mix well and apply the mask to clean skin with a brush. Keep the mask in place for 10/15 minutes. Wash your face with warm water to remove the cream, then immediately make a compress with cold water to reactivate the circulation.